Free shipping to United States with $25 purchase from thelightandthedark1. See item details below for sale terms. Please leave the names, and birthstones you would like. Please specify which name you would like on the small disc, medium disc, and which on the large disc. This is a custom mom/grandma/brag stack. 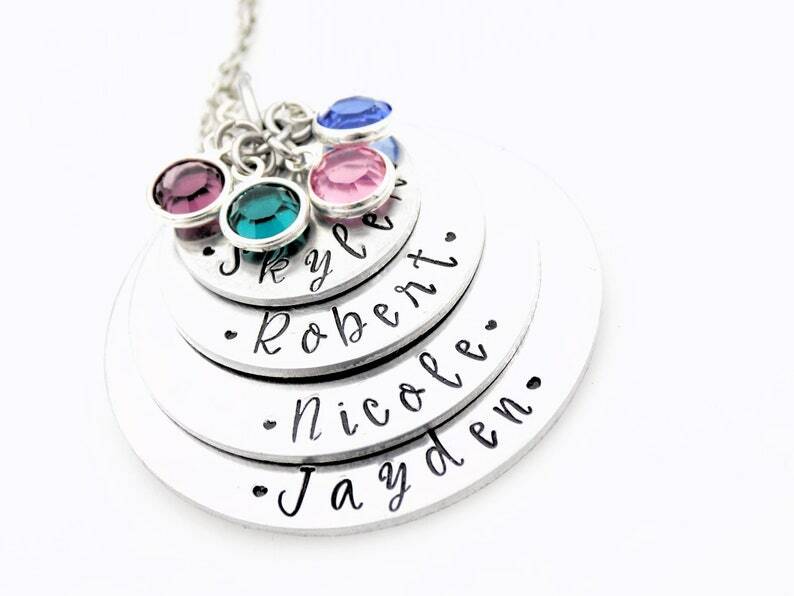 Please leave us a next in the text area during checkout with your 4 names and birthstones. Please leave the names and birthstone selections in your checkout notes. Birthstone options are Jan, Feb, March, April, May, June, July, Aug, Sept, Oct, Nov and Dec. Please see our shop announcement for current production times. Production time is the amount of time it takes to make/package your order and does NOT include shipping times (which vary depending on which method you have selected). This listing is for One hand stamped charm and a chain of your choice. Personalization: Please select 3-5 Names and 3 birthstones. This information is required, failure to include necessary location will result in a delayed or possibly cancelled order. Size: Top charm 1", middle 1 1/4", bottom charm 1 1/2"
Our process is called Hand Stamping. It is done manually, and not by a machine, so reasonable variations can occur in regards to letter and symbol placement, though we attempt to stay as close to the pictured design as possible. please feel free to utilize this valuable etsy feature. Please see our list of FAQ here https://www.etsy.com/your/shops/thelightandthedark1/policies to see a list of commonly asked questions answered. Items will be in a gift box, inside of a matching gift satchel. Minimum order to qualify for free shipping is $25. Where do I leave custom order information? When you add your item/items to the cart, before you hit the "Proceed to checkout" button you will see a text area that says "Add a note to thelightandthedark1 (Optional)". That's where we'd like you to add custom text, initials, names, birthstones, number of miles, locations for state sets, and any other custom information we'll need to make your order more personalized for you. To ensure your jewelry keeps looking its finest, please remove before showering, swimming, or other prolonged exposure to water. Please be careful not to get hand sanitizer, or other products that include alcohol on your stamped jewelry, as it will remove the oxidation. Gold, Silver, Copper, Bronze, Brass and Nickel tarnish over time due to skin oils and other environmental factors. Aluminum and Stainless steel do not. Wipe your jewelry with a soft cloth after wearing to remove dirt and oils. Never use jewelry cleaning dips or liquids as these can remove the oxidization (blackening) in the characters in your jewelry. Please contact via Etsy conversation. We only respond to Etsy conversations.. so please do not personally email us outside of Etsy. All convo's will be answered in a timely manner, please feel free to reach out with any questions you have and we'll be happy to answer them to the best of our ability. All items arrive gift ready in a satchel that matches the branding of our store. Gift cards can be added in for no additional charge (please leave custom message in the Text box during checkout. Additional gift packaging/wrap can be purchased during the checkout process. Custom charges are your responsibility and are decided by the receiving country. We can not allow you to pre-pay them, so these charges are not added into the cost of your order. All international orders will contain a printed receipt in a special pouch on the outside of your bubble envelope - for easy access at customs. There is limited delivery tracking on International orders with first class shipping. International shipping times vary it may take anywhere from 2 weeks to 12 or possibly longer. I am required by Federal Law to write the accurate item price, and mark your customs form as merchandise. I will not falsify a customs form in any way, it is a federal offense. What is the difference between Hand stamped, Laser Marked, and Laser Engraved Products? Hand stamped items are all made, by hand, letter for letter. A steel stamp is taken and then hammered into the metal to create a deep indentation. You can see/feel the indentation made, and it sometimes will not be completely uniform as a machine engraved item will be. Laser marked items are kind of imagine being printed or burned into metal, it leaves an indentation, but not too deep. You can see/feel the image, and feel a very slight indentation, but the image also feels rough and gritty and almost raised to the touch. Laser engraved items are when a laser removes enough material from an piece of metal that it leaves a deep impression. You can feel the indentations, and the lines are clean and crisp.